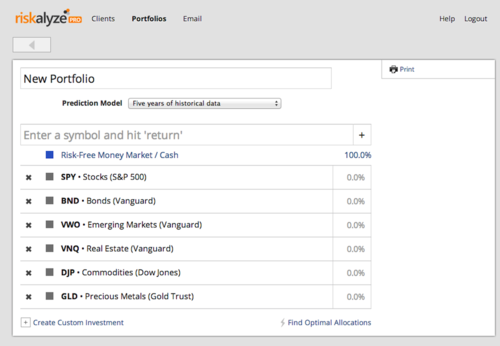 Today, we’ve launched some great updates to Portfolios in Riskalyze Pro that make it faster, simpler and even more powerful than ever before. Faster. When you create a new portfolio and add symbols to it, it’s lightning fast. Just type in the symbols as fast as you can and press enter after each one. We validate the symbol and grab the name in the background within a few seconds. Simpler. If you’re building a model portfolio or analyzing a client’s existing portfolio, just fill in the allocations like a spreadsheet, and the analytics update as you go. It’s fast, efficient and almost instantaneous. Even More Powerful. 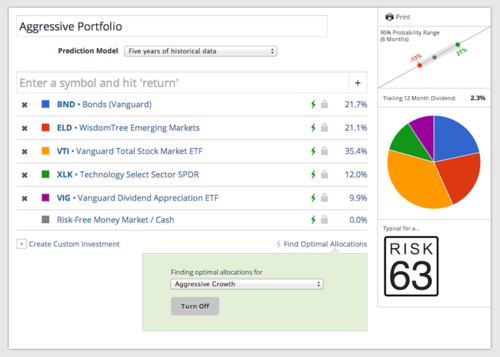 On the other hand, if you want Riskalyze Pro to find the optimal allocations for the portfolio, you just click that button, choose the Risk Tolerance setting (or a client’s unique Risk Fingerprint), and click Start. Smart advisors will then use their own beliefs about the future (e.g. bonds have more risk than historical data might suggest, technology is undervalued, this client might have upcoming liquidity needs) to lock a few of the allocations. To do that, you just click the lock beside that fund, enter a value and press enter. The rest of the portfolio will automatically recalculate around that constraint to try to hit the risk target you’re looking for. And One More Thing. 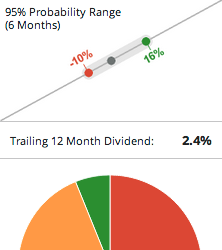 We’re still just scratching the surface of the analytics we intend to deliver for portfolios, but we did roll out something a lot of advisors have asked for: the trailing 12 month dividend for a portfolio. Now, as you change a portfolio’s allocations, you’ll see a live look at the trailing twelve month dividend yield for that portfolio. It’s a great way to understand the dynamics of the potential return for the portfolio you’re building. 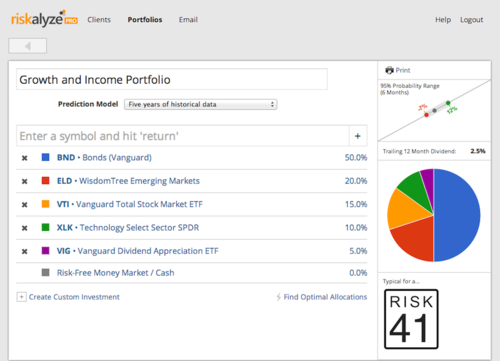 The updated Portfolios tool is live today for all Riskalyze Pro customers. If you’d like to join a guided tour for Riskalyze Pro, just register here.